Milwaukee Tool is expanding its line of outdoor power equipment solutions with the Quik-Lok attachment system. 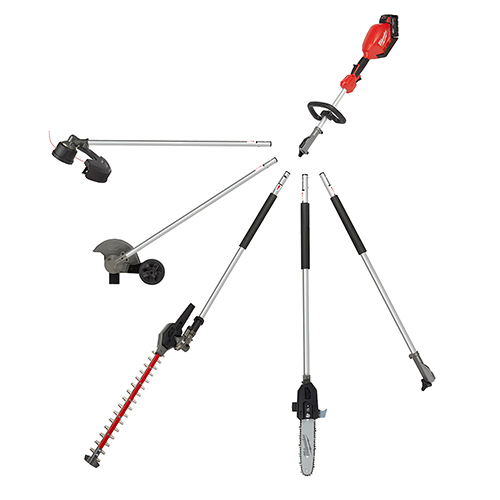 The new system is made up of multiple attachments including a string trimmer, edger, pole saw and hedge trimmer. For the versatility to complete a wide range of applications, users can swap between attachments for use on the M18 Fuel power head. Powered by M18 Fuel, the Quik-Lok attachment system achieves instantaneous throttle response while being up to 2 pounds lighter than the other options on the market. Users can enter the Quik-Lok attachment system through the M18 Fuel string trimmer with Quik-Lok or M18 Fuel 10-inch pole saw with Quik-Lok. Once installed in the Quik-Lok attachment system, users can easily add on any additional attachments they need, when they need them. This string trimmer has the power to clear thick brush, reaches full throttle in under 1 second, and provides up to 1 hour of run-time per charge. An adjustable 14-inch cutting swath maximizes run-time and offers ample power for grass trimming, while a 16-inch cutting swath maximizes clearing power and clearing capacity to trim more grass in a single pass, the company said. Optimized for tasks that require extended reach, the M18 Fuel 10-inch pole saw with Quik-Lok has the power to cut hardwoods, reaches full throttle in under one second, and provides up to 150 cuts per charge. Capable of delivering up to 4,600 RPM, the pole saw has a 10-inch Oregon bar and chain which delivers smooth and fast cuts with minimal kickback. Additionally, the pole saw has an automatic oiler for proper chain lubrication, an easy access chain tensioner for quick adjustments, and a branch hook for extra cutting leverage and branch removal. A 3-foot attachment extension is included for applications requiring even further reach. Designed with an 8-inch blade and adjustable wheel for optimal control of blade depth and tool angle, the M18 Fuel Quik-Lok edger attachment is ideal for creating a clean line of separation between vegetation and hard surfaces. Delivering 3,900 RPM, the edger attachment is built with optimized gearing to help maintain speed during demanding applications without bogging down. Due to its close contact with concrete, this attachment is also built with a high-strength metal alloy guard and skid plate to protect the gear box. In addition, mud flaps help prevent dirt and debris kick-back. These new tools are fully compatible with the entire M18 line.